The improvements really do add up, as subtle as they are. If there’s one thing about the incredibly intense competition: the innovation it breeds is almost always great for the consumer. 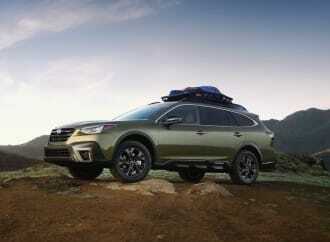 The trickle-down nature of the automotive industry has been great for the mainstream motoring public; features previously seen only at the upper-end of the price scale are now features that just about everybody wants in their everyday cars. 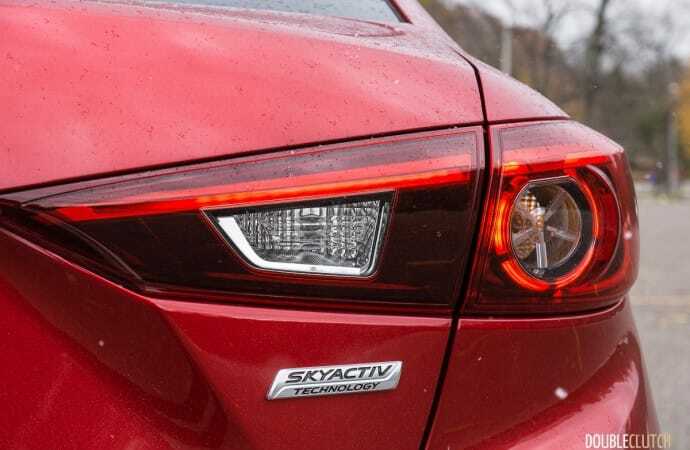 Mazda has always built the driving-focused choice in nearly all of the segments they competed, and the Mazda3 is no exception. 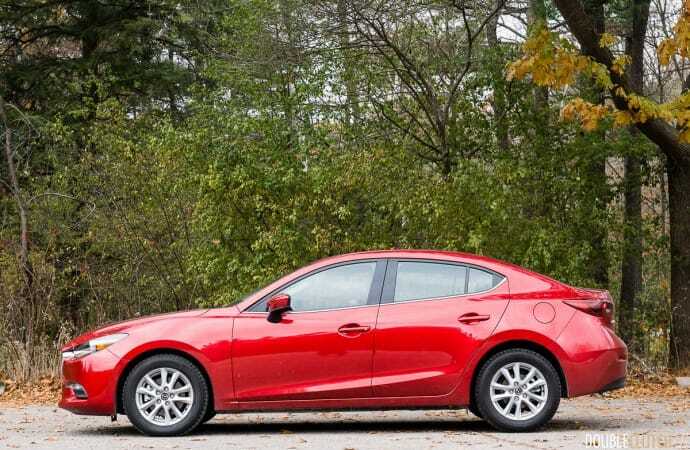 Blessed with enthusiast-friendly features like eager engines, fun manual transmissions, excellent automatic transmissions, and a genuine focus on agility, the Mazda3 represents a large chunk of their passenger car bread-and-butter. The competition, as always, has been merciless, with relatively short model lifecycles and regular updates to keep things fresh. 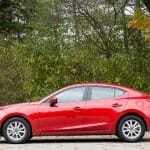 The Honda Civic remains the juggernaut in this community, being a perennial best seller in this country. 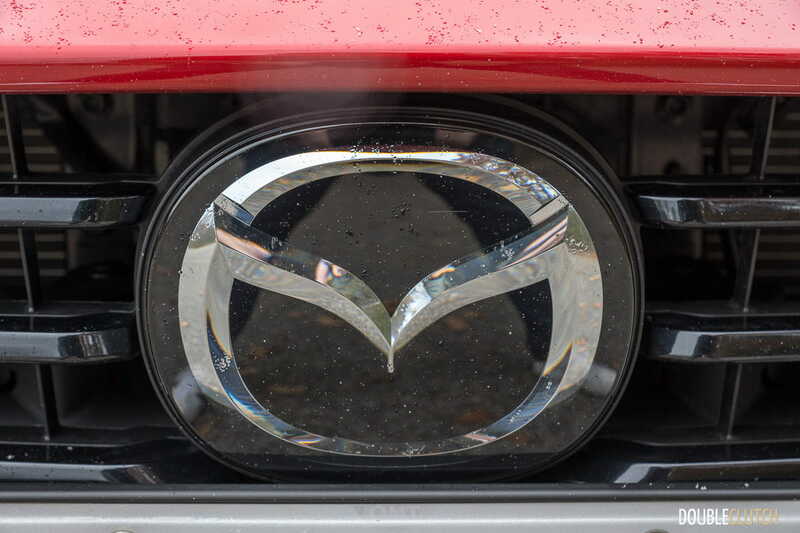 Mazda, as a brand, is a lot smaller than Honda and Toyota; so it often carves out its own path, hence the big Zoom-Zoom advertising seen years ago. The new Civic brings along surprising refinement, value, and the kitchen sink when it comes to active and passive safety systems. 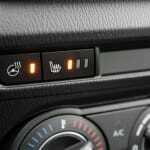 It’s what people are looking for, and one of the big updates to the Mazda3 is the available i-ACTIVSENSE safety suite. 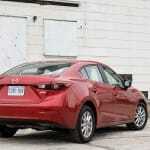 We were sent over a Soul Red Metallic Mazda3 GS to check it out. 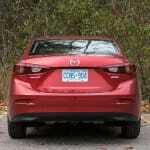 The Mazda3 has always been a decent-looking car, and Mazda has sought to keep it essentially unchanged since it was updated for the 2017 model year. 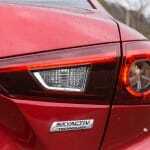 Mazda themselves says the tweaks are “subtle”, with a different front grille (that better connects to the headlights) essentially rounding out the external changes. 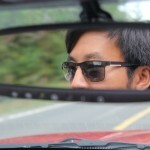 Unfortunately, any jurisdiction that requires a front license plate (such as Ontario) sees it get placed smack dab in the middle of the grille. 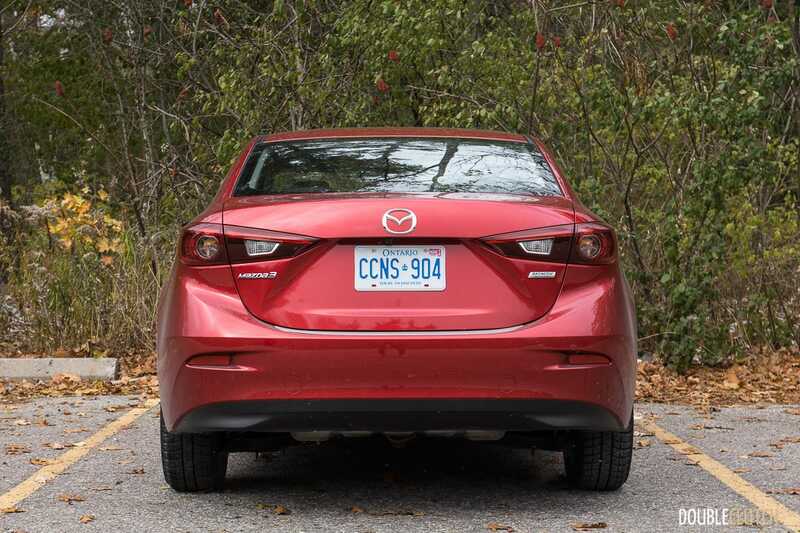 The Mazda3 is definitely a sharp-looking car, but front license plates, as always, ruin the party. 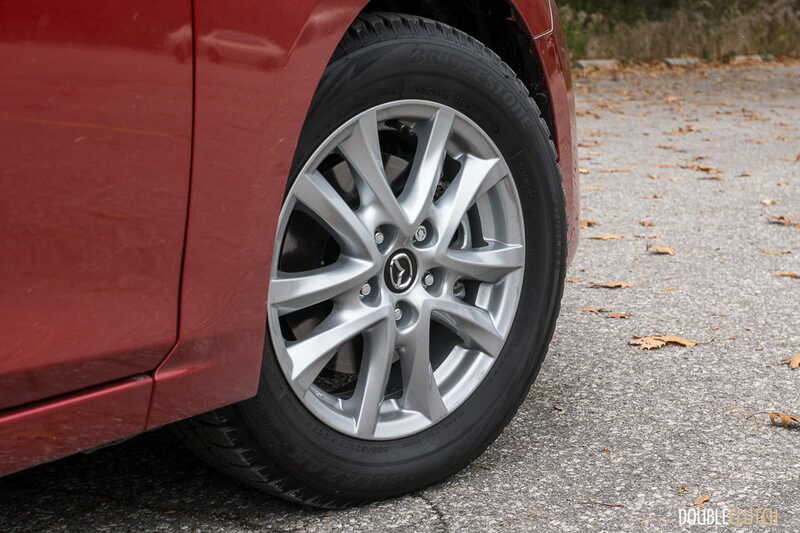 The GS model wears the same set of carry-over 16-inch wheels from the pre-update Mazda3. One giveaway for eagle-eyed Mazda enthusiasts would be the combination of mid-range 16-inch wheels, combined with the LED headlights and taillights that are added as part of the i-ACTIVSENSE package. 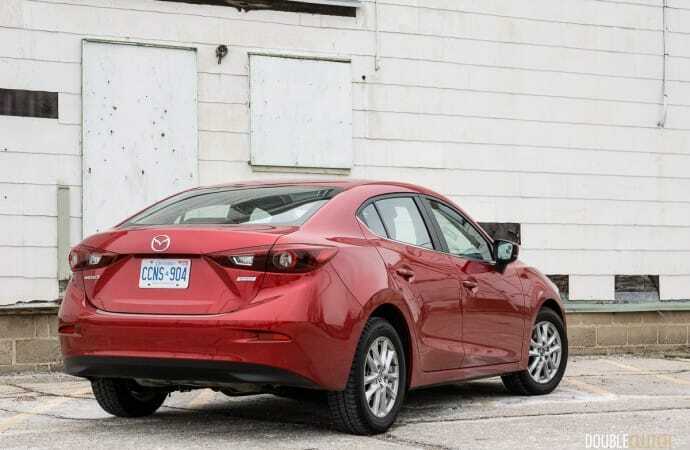 Fun fact: hidden under the rear bumper cover are dual exhaust tips – the Mazda3 Sport hatchback makes them more visible with chrome tailpipe finishers. Inside, the Mazda3 doesn’t change very much, with the large seven-inch fixed touchscreen that lives on top of the centre stack. 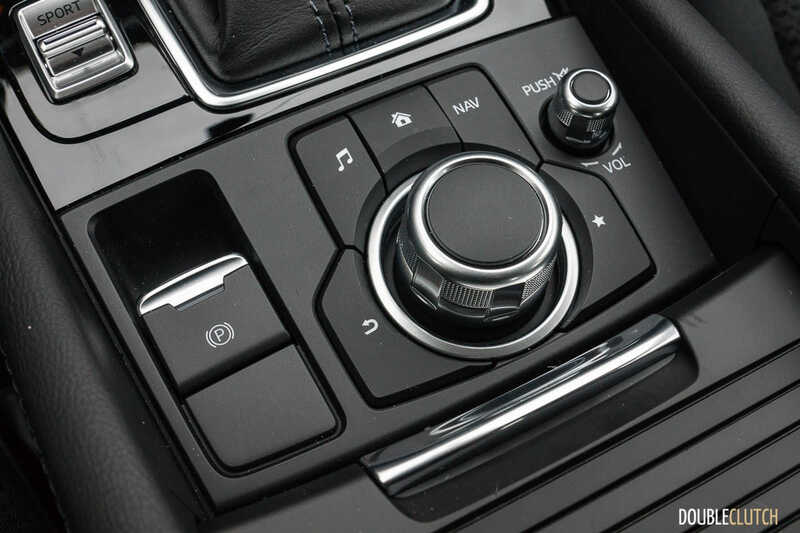 One disappointment: it still doesn’t get Android Auto or Apple CarPlay integration. 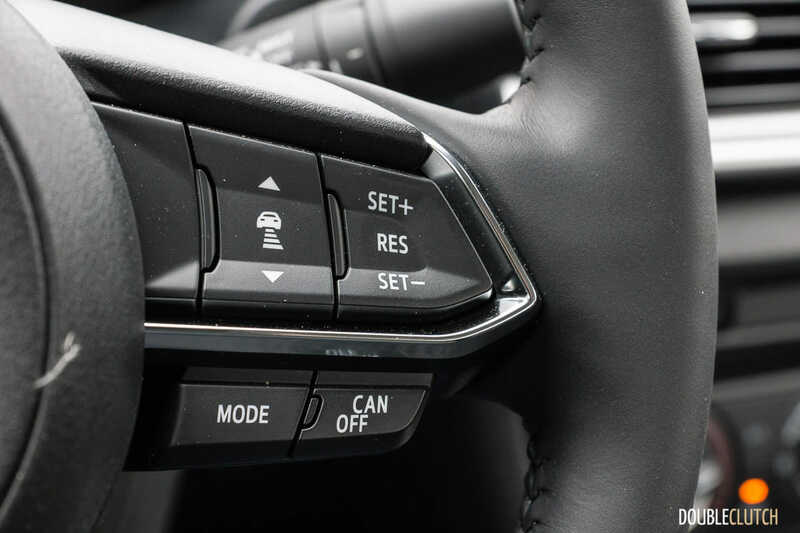 Cloth seats are the name of the game with the mid-range GS model, but Mazda does a great job with the leather-wrapped steering wheel and heated seats – both features are standard on the GS. 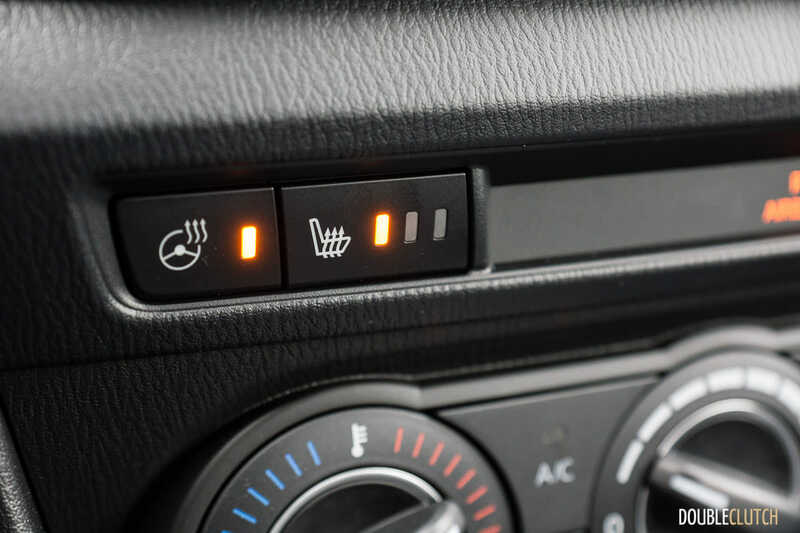 You can tell they are made for Canadian winters – the heated seats and steering wheel come up to temperature extremely quickly, almost to the point of being uncomfortable within just a few minutes. In other words: perfect. 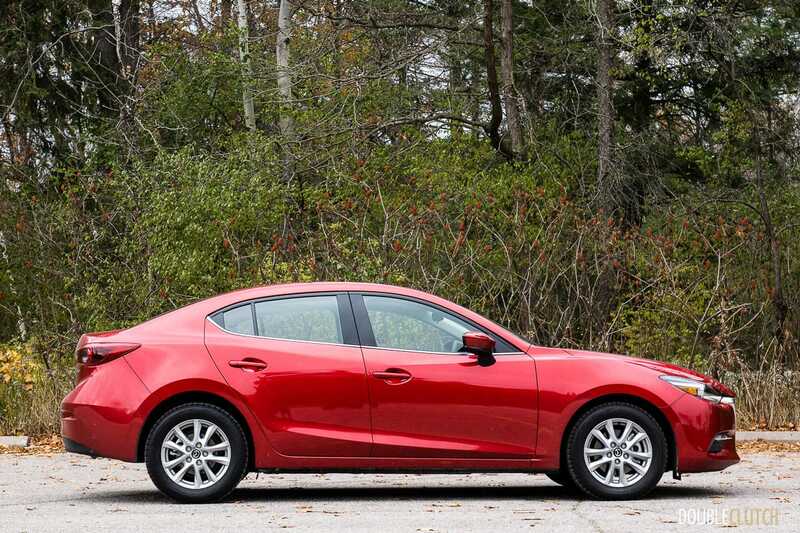 The pre-facelift Mazda3 was always known as a loud car, thanks to the lack of soundproofing, and noisy factory-fitment tires. 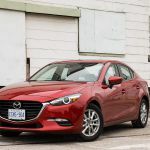 One of the updates for the refreshed Mazda3 tries to resolve this flaw, by way of increased soundproofing, tighter body gaps, and re-designed weather stripping. 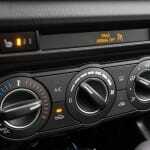 The claim is that the interior is 3dB quieter at 40km/h. While this doesn’t sound like a whole lot, I can tell you that the overall noise profile is noticeably improved. 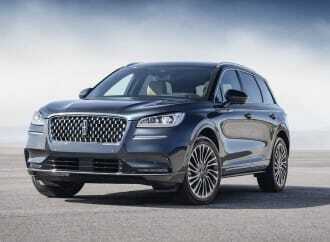 It’s not luxury car quiet, but it is now much more in-line with its competitors. 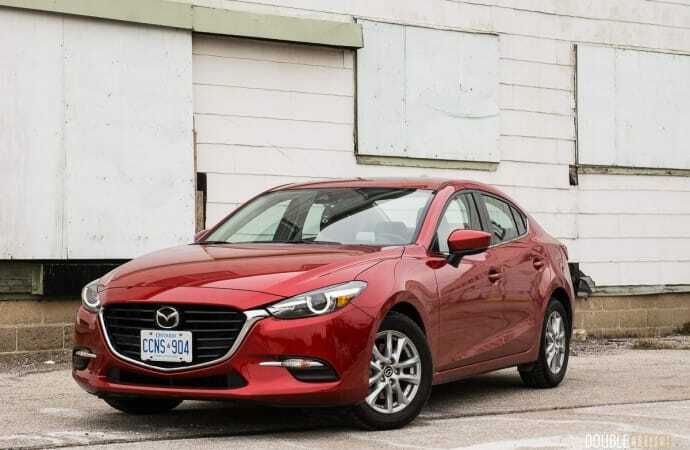 The updated Mazda3 GS borrows some features from the fully-loaded GT model, including the much-improved instrument cluster. 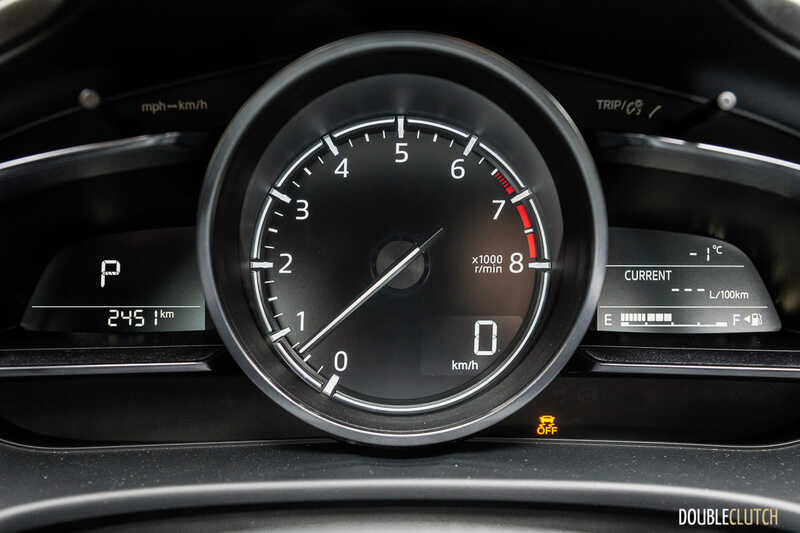 The standard Mazda3 GS (reviewed here) of yesteryear utilized a digital tachometer that lived off to the side of the instrument cluster. 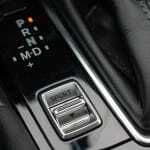 It was a little too small, and not the best to see at a glance, especially if you’ve opted for the manual transmission. 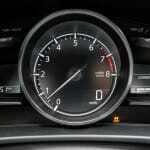 The cluster now puts the tachometer front and centre, with a digital speedometer readout. 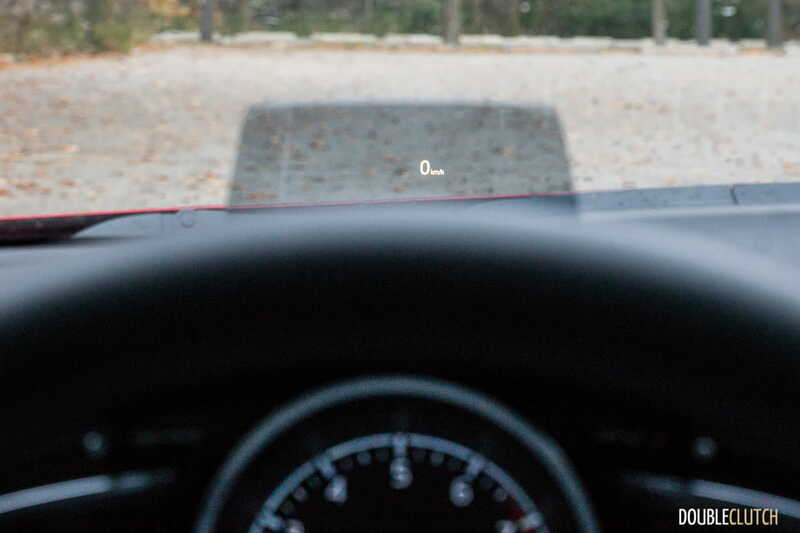 Opting for the i-ACTIVSENSE package also gets you a heads-up display (via a small piece of glass on top of the instrument cluster, rather than the windshield itself), active and passive safety technologies, and the aforementioned LED lighting, front and rear. 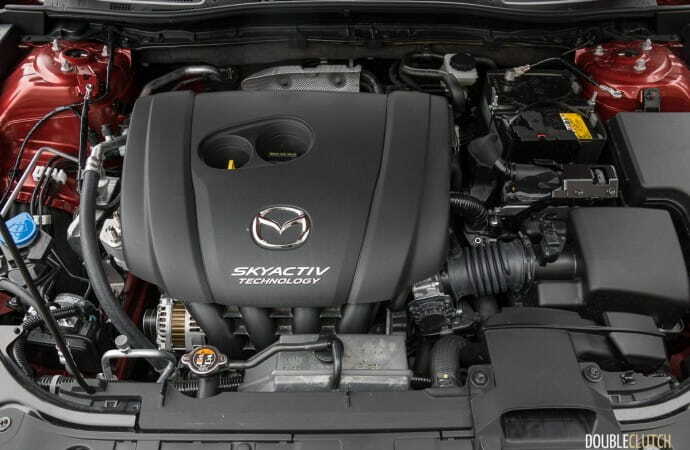 Under the hood, the powertrains continue to serve, essentially unchanged. 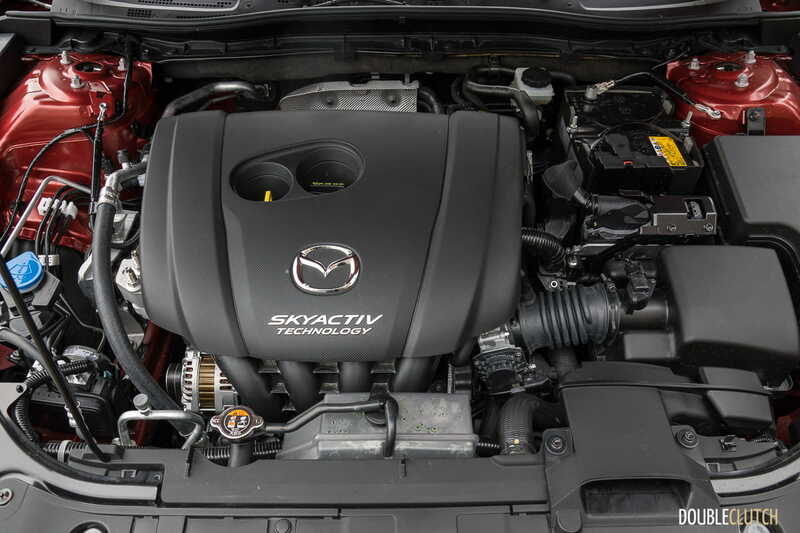 The base GX and midrange GS are powered by a “SKYACTIV” 2.0L gasoline inline-four, producing 155hp at 6000rpm and 150lb-ft of torque at 4000rpm. 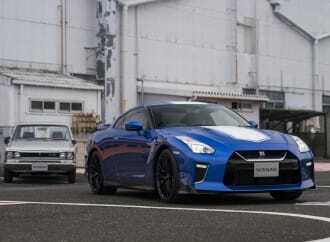 It is a thoroughly modern engine, with direct injection, super high compression (13.0:1), and it sips regular fuel. The top-end GT model steps up to a larger 2.5L inline four, good for 184hp. 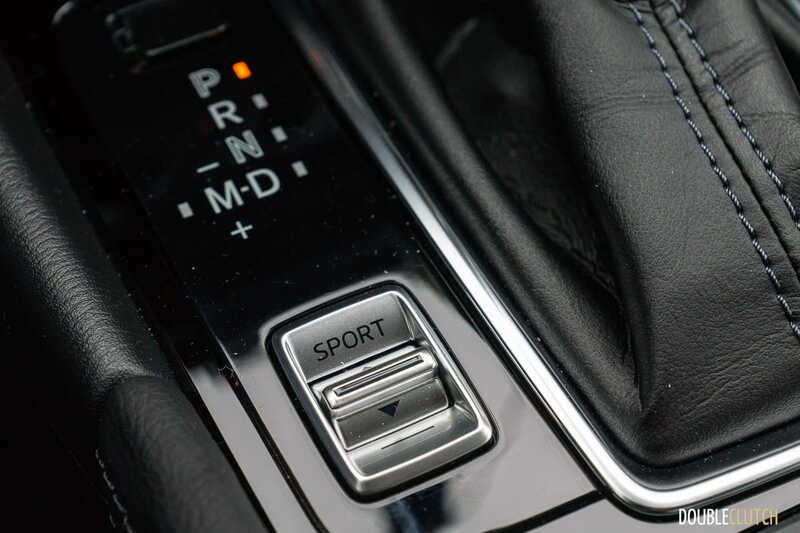 Power is routed to the front wheels through your choice of a six-speed manual transmission, or a six-speed SKYACTIV-Drive automatic transmission. There are no CVT automatics here – Mazda sticks to the tried and true torque converter-based automatic, and calibrates it to near perfection. The aggressive torque converter lockup strategy allows for a very crisp and direct feel, with quick gear changes, making the most of the naturally-aspirated power. 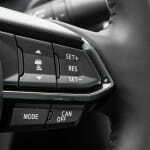 One of the new items that Mazda is particularly proud of is their new G-Vectoring Control (GVC). It is a new software program that references one of the most important fundamentals in motorsport: weight transfer. Whether you’re on an autocross course, the race track, or even just a highway onramp – weight transfer is everything. Being able to better manage the lateral and longitudinal load at each wheel is what translates into real improvements whether you’re racing against the clock, or just looking to get home. 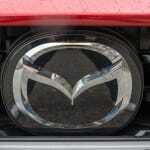 Mazda’s implementation is very subtle in its operation, and most probably won’t even know it’s there. 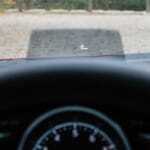 Under the right parameters (when the accelerator pedal is applied, and the wheel is turned), the onboard computer makes very minute adjustments to the engine’s timing. This reduces engine output, ever so slightly. In a corner, this has the effect of transferring weight back towards the front axle, which translates to the front turning wheels exerting more force on the ground, which generally means more grip. 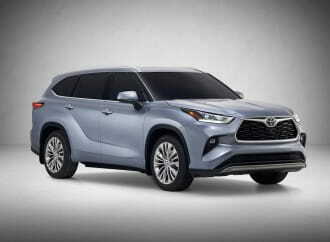 Mazda says GVC has the effect of smoothening out driver inputs, resulting in a smoother ride for passengers on all road surfaces, and improved handling feel. 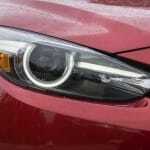 It is fitting that an engineering-focused automaker such as Mazda would be one of the pioneers for this sort of subtle technology. 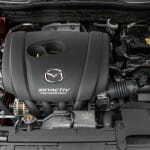 The Mazda3 with the 2.0L engine and automatic transmission is rated at 8.4L/100km in the city, and 6.4L/100km on the highway. 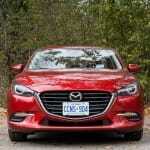 During my cold week of mixed driving in Toronto with the Mazda3, I ended up with an indicated average of 8.0L/100km. 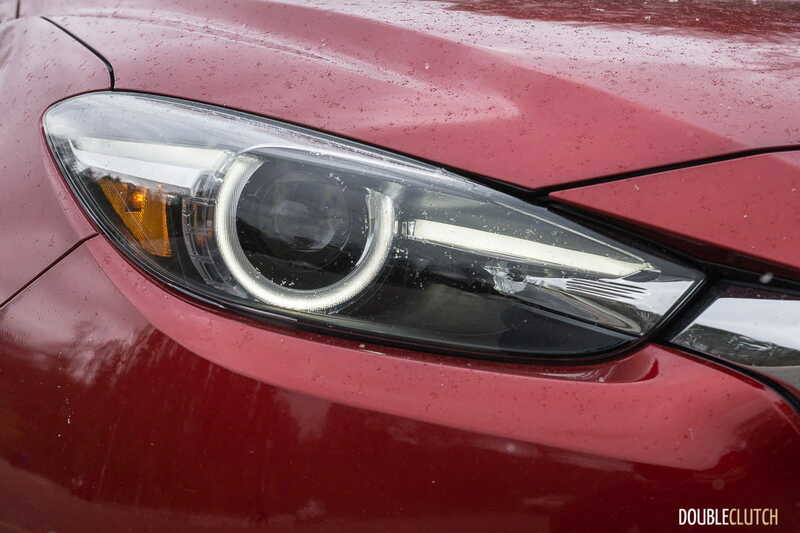 It’s worth noting that this particular tester was fitted with Bridgestone Blizzak WS-80 winter tires, which will affect overall fuel consumption, slightly. 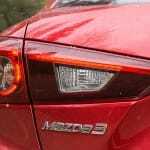 The Mazda3 will hold up to 50L of regular 87 octane fuel. 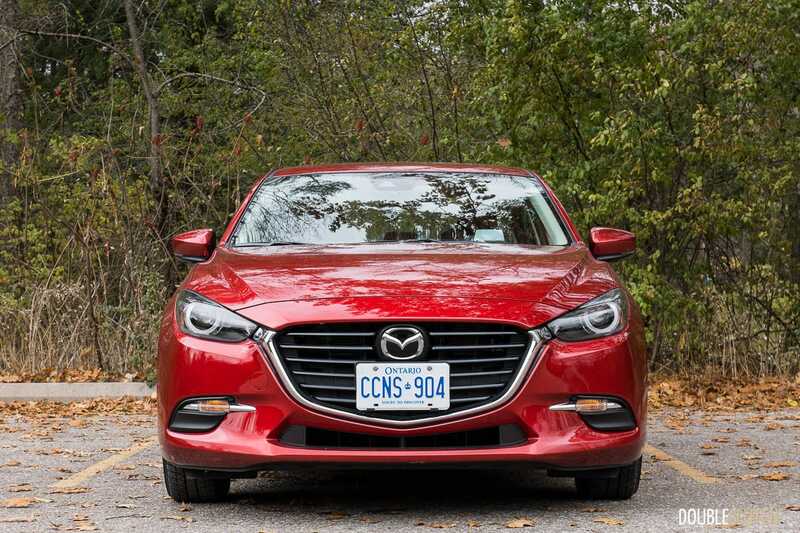 All these features and gizmos may seem like they add up to a significant dollar value, but in the grand scheme of things, the Mazda3 continues to be an excellent value. 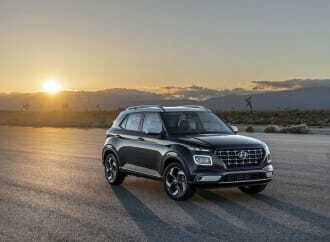 The base GX starts at $15,900, with a manual transmission (and no air conditioning or tachometer), and the base GS ($20,300) adds items such as 16-inch aluminum wheels, heated front seats, heated steering wheel, and some active safety tech (blind spot monitoring and rear cross traffic alert). 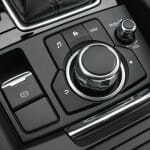 Choosing the six-speed automatic adds $1,300 to the price of the GS, and the $900 moonroof package becomes mandatory when you add the $1,500 i-ACTIVESENSE package. 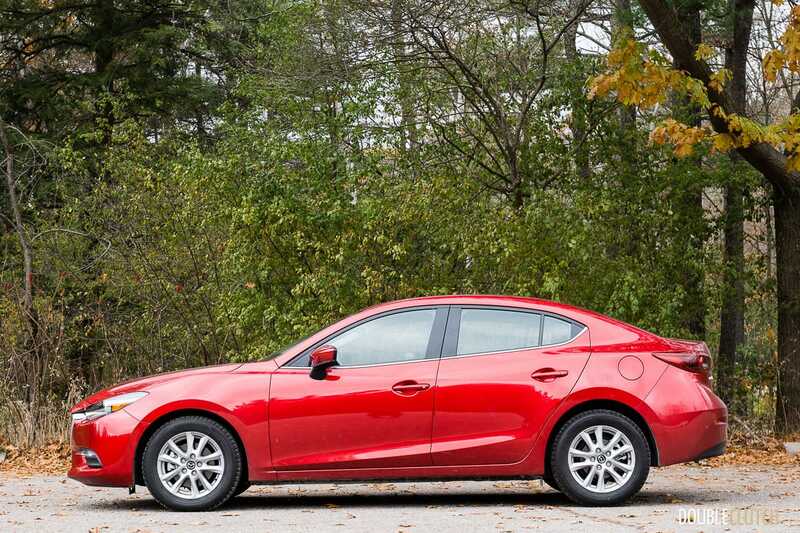 As tested, this brings the subtotal to $24,300 for this Soul Red Mazda3 GS. 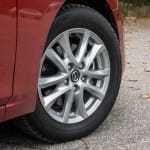 Competitors like the Honda Civic (reviewed here), Hyundai Elantra, and Volkswagen Golf all chase a similar customer, and it really is difficult to ignore the sheer value for money you get with just about any choice in this class of cars. 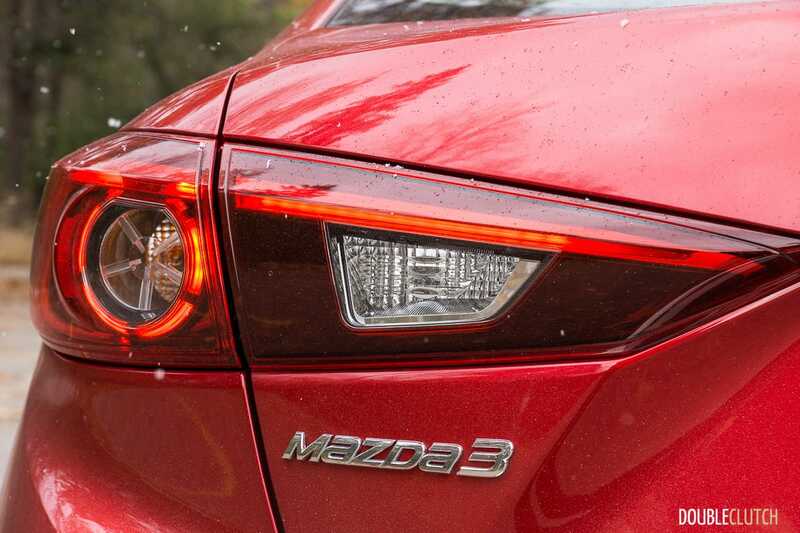 It all depends on what you’re after, but the Mazda3 has always been the enthusiast’s choice when it comes to compact cars. 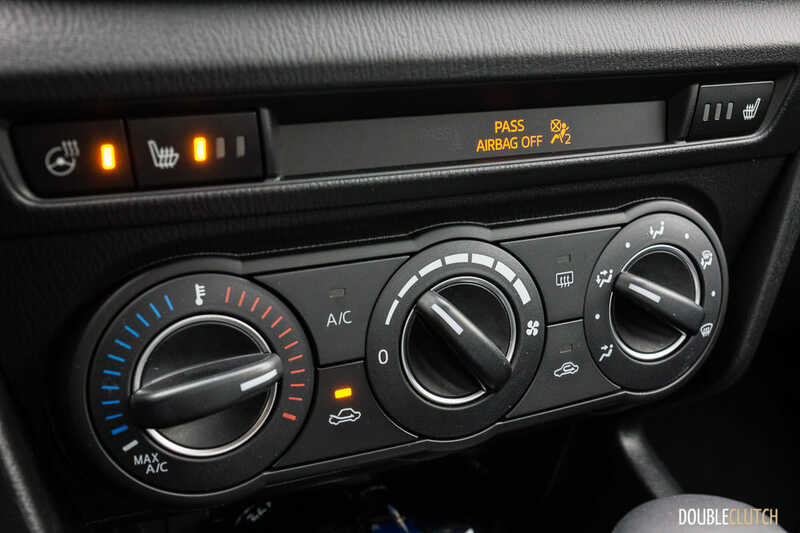 The practical body design, excellent steering, and good driver’s interfaces has earned the small company a cult following by those who are looking for more than just an appliance to drive from point A to point B. 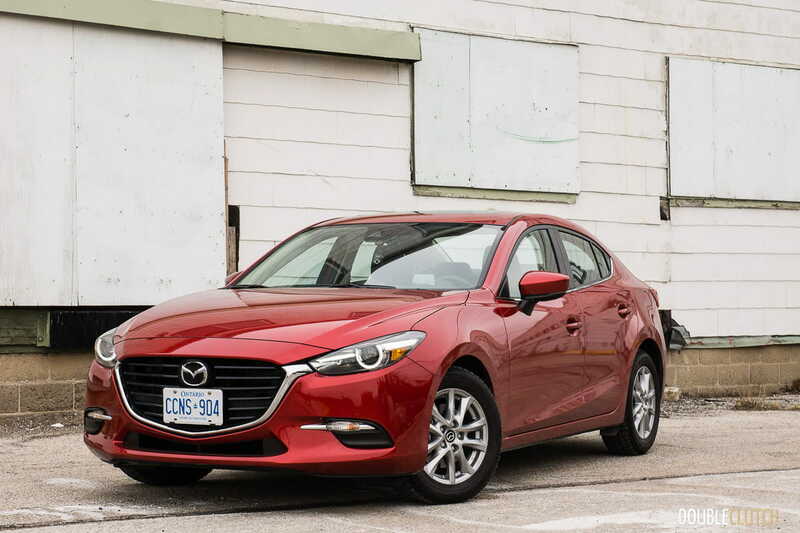 They say “driving matters”, and the Mazda3 does a great job getting people into the mindset that they should care about the act of driving. The improvements really do add up, as subtle as they are. 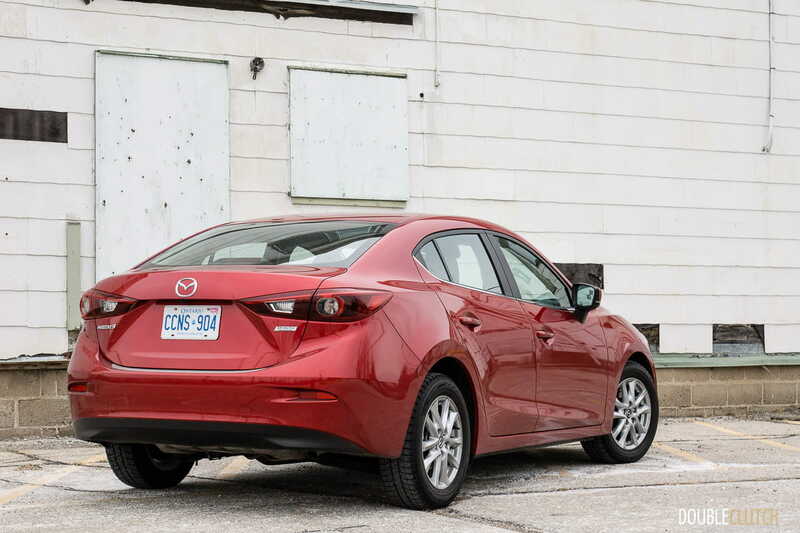 The G-Vectoring Control, noise reduction, and the re-jigging of some options keeps the 2018 Mazda3 GS fresh, and the aggressive pricing means they should continue to sell the Mazda3 in bucket loads, as has been the case here in Canada for quite some time. This was a very enjoyable car to pilot for a week.